Top Shelf to Middle Shelf 11.25"
Top Shelf to Bottom of drawer is 18"
Top Shelf is 22" x 14"
Plenty of space for a Cabi! This excellent 3 shelf trolley can come in handy whenever you need to move or store items. Welded steel construction and durable white finish. 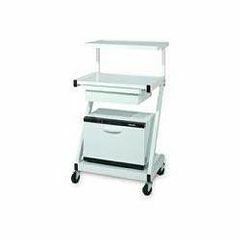 With an open middle shelf you can easily push the trolley, stack your papers and clipboards or just store equipment for transportation. In case you take a lot of items with you at once or want to have everything in one place the drawer can hold whatever you need without worries of dropping or losing anything. Great for small equipment and massage tools! No tools necessary. **Please Note: Hot Towel Cabi not included.